This is the most promising new product that I have seen in many years—and it's not a pager! 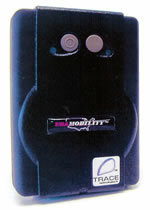 It's an amazing tracking device from Trace Technologies. Be sure to read their press release that follows below. I found an article about USA Mobility that I would recommend to anyone following their activities. I do, however, strongly disagree with several statements in the article, especially: "The company, which is essentially synonymous with the industry because it has some 6 million of the nation's 10 million pager customers . . ." I don't think it is fair to lump the industry all together with USA Mobility because they are facing challenges that are different than the ones local and regional paging companies are facing. The article concedes that pagers have certain advantages over cell phones and that "maybe there will always be a market for pagers" but unfortunately the writer's conclusion is that Paging will not be around much longer. I think he is mistaken and I continue to receive encouraging reports of new products and services that reinforce my optimism that Paging will not die. Some Paging companies are doing better today than ever before in their history. If you want to read this article, it appeared in the April 5 issue of The Motley Fool, and its title is: Paging USA Mobility Users. I think USA Mobility will be OK as soon as their attrition levels out—and it has definitely started to do so. The amount of attrition has decreased quarter-by-quarter for over a year. As in any business, customer satisfaction is the key. Sears and Wal-Mart built two of the world's largest retail chains. The next time you go by one of their stores, take a look at the slogan over the door. Both companies promise customer satisfaction. It's the attitude of winners—always has been. Please note that I have changed the layout of the newsletter a little this week. Be sure to scroll all the way to the end as there is a lot of interesting news and some photos from my trip to Las Vegas. Also, please note the new ad from Sun Telecom International. Thanks Sun! Multitone Electronics has some classy new pagers in their ad as well. US Paging Carrier Directory Project Lives On! Several months ago we announced that this project was underway. Well, due to some difficulties along the way, we've been delayed. But now the project is back on track! We've stripped down the questionnaire so it contains only basic information and, thanks to the FCC Paging Frequency audit conducted last year, we have a good base of information from which to start. If you have already completed a Carrier Directory Questionnaire, thank you very much! You do NOT need to do another one. If you have not done so yet, PLEASE consider filling out the document found at this link. 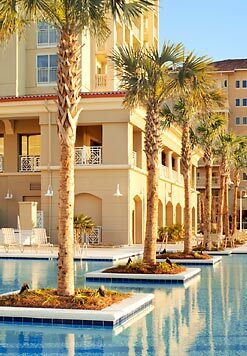 Our goal is to have a version ready for publication at the AAPC Wireless Forum at Myrtle Beach in early June. Please consider helping out the industry by doing your part—fill out and return this questionnaire today! 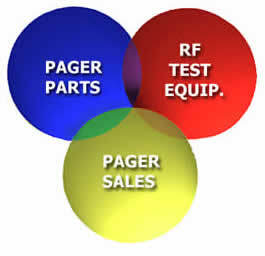 Contact: Alan Carle acarle@ucom.com or Linda Hoover info@pagingcarriers.org with questions. The SkyTel executive office took immediate action when it learned that the husband of an MCI employee had been placed on the organ transplant list to receive a donor liver. Within hours, details were confirmed and SkyTel provided, at no cost to the patient or his family, a pager with SkyTel paging service for as long as the patient remains on the transplant list. Having the pager not only gives the patient freedom from being limited to telephone notification; even more important, it offers the comfort of knowing that he can receive instant notification as soon as a donor organ becomes available. Exhibit at the largest paging event on the East Coast! Exhibit space is selling fast! Secure your space now by completing the exhibitor contract. Omaha, Neb. 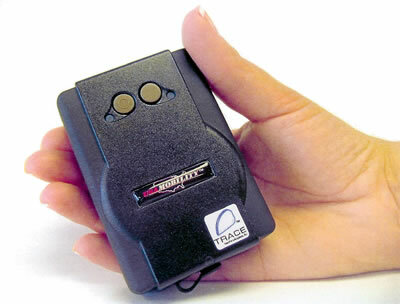 April 5, 2005—Trace Technologies, LLC unveils a new asset tracking system fusing advanced GPS, wireless and Internet together into one integrated product. The Trace technology combines SnapTrack™ Wireless Assisted-GPS™, the Trace Asset Tag (G-Tag) and the ReFLEX wireless network allowing consumers to locate critical assets and people quickly and easily in environments conventional GPS loses accuracy. The G-Tag is one of the world's smallest, most sensitive portable devices and can be located inside buildings and vehicles, urban canyons, under heavy foliage and in other blocked environments where conventional GPS doesn't operate. Consumers make a location request through an ASP site that is forwarded through Trace and on to the wireless network. 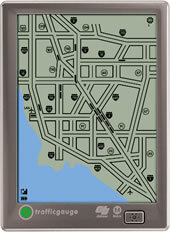 The device captures and calculates GPS data and sends it to Trace's servers via the wireless network. For devices in assisted-GPS mode, Trace's SnapTrack-based Position Determination Entity (PDE) employs a Wide Area Reference Network (WARN) of precision GPS receivers to provide acquisition assistance data and compute fixes from GPS satellite measurements. An ASP can translate latitude and longitude into a street address and map the location or perform other location-based services. The service is ideal for people with concerns about safety and security. Other applications may include: asset security, first-responders, roadside assistance, medical emergencies, mobile commerce, games and entertainment. The service is provided by Trace on a wholesale basis, giving customers the ability to efficiently and cost-effectively take the value-added service to market to assist in their overall security solution. More information about QUALCOMM's SnapTrack™ technology is available on their web site. MEXICO CITY, April 11 (Reuters)—Mexican tycoon Carlos Slim's sale of his 13.7 percent stake in MCI will lift his phone company Telmex's second-quarter profit, help cut debt and fund its expansion outside Mexico, analysts said. Slim, the world's fourth-richest man, agreed over the weekend to sell the largest single stake in U.S. telecom MCI Inc. to Verizon in a deal that will give him $1.1 billion, and Telmex is the biggest beneficiary. "Telmex will receive approximately $660 million," said analyst Xavier Escala with Banif Securities, estimating that Telmex directly owned 25.6 million shares, or 8.1 percent, of MCI. Other Slim-owned companies owned the rest of the MCI stock. Analysts believe the cash will be used to boost Telmex profits at a time when it is struggling to lift revenue as strong cellular phone usage bites into its core fixed-line business. Ana Gabriela Ocejo with Scotia Inverlat estimated the company will receive $674 million from the MCI sale in the quarter ending in June. "I don't see them making an important acquisition . . . but they could use it to cut debt." Telmex declined to comment on the MCI deal, which has to be approved by U.S. regulators. Telmex, the main provider of local and long-distance services and Internet in Mexico, was busy in international debt markets earlier this year as it took advantage of good credit conditions. It ended last year with $8 billion in debt, up 31 percent from 2003 as it took on debt from Embratel, the Brazilian long-distance operator which Telmex bought for $400 million. Ocejo said Telmex could also use the cash to further consolidate its business in Brazil, the company's flagship operation in South America. Telmex has expanded its presence outside Mexico in a drive to grow revenue and fend off other regional rivals. The company now has units in Brazil, Colombia, Peru, Argentina and Uruguay. Banif's Escala also said the MCI share sale could give an extra lift to Telmex's ventures Embratel and Net Servicos, Brazil's No. 1 cable television firm. Telmex now holds a majority of the voting shares in Net, its latest foray in the South American nation. With an infusion of $15 million, InnerWireless Inc. will double the size of its Richardson headquarters and boost its staff by 50% over the next 12 months, the Richardson high-tech company says. The third round of funding, led by Milwaukee-based Johnson Controls (NYSE: JCI), comes on the heels of contracts InnerWireless is netting from a half-dozen large organizations, including the National Institutes of Health, Houston's ChevronTexaco and the new Baylor Regional Medical Center at Plano. "We see this market segment coming into its own over the next two years," says Ed Cantwell, InnerWireless' chairman, president and CEO. "We are fortifying the company from a capitalization point of view." Cantwell says this equity funding will be InnerWireless' last. All told, the firm has raised $50 million since its August 2000 inception. Nearly all of InnerWireless' existing investors participated in the latest round, including Dallas firms Sevin Rosen Funds and Genesis Campus. One new addition was Centennial Ventures, a Denver-based venture firm with expertise in the wireless area and with offices in Houston and Austin. Cellphones, personal digital assistants and similar devices often can't be used in parts of large office buildings and corporate campuses, such as elevators and underground parking garages because of technical and construction limitations in cellular networks. 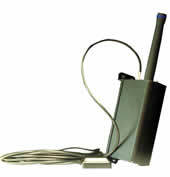 InnerWireless solves the problem by installing its system of cables, antennas and base stations. In some cases, InnerWireless owns the system outright and makes recurring revenue from leasing capacity on its system to parties that want to provide wireless services, such as cellphone companies. An example of that business model is in place at New York's Rockefeller Concourse Center and other public venues with large amounts of foot traffic. In other situations, InnerWireless co-owns the system with the building's manager. The landlord can use the system for its own uses, like paging and fire-safety matters, while InnerWireless can simultaneously lease time to wireless services firms. When selling to large institutions like the government, the client often buys the system outright. However, Cantwell says the company is increasingly moving to either owning or co-owning its system, and offering it like a utility such as air conditioning. Later this year, the company will start using this model with hospitals. InnerWireless has about 60 customers. It has established a 10-person sales team around one of its biggest customer bases, health care. A sales group of identical size targets InnerWireless' two other main client groups: the government and large corporations. The company's 100-employee staff will grow by 50 over the next year, with the new additions being primarily project managers, engineers and designers. With 30 of the hires occurring in Richardson, InnerWireless is roughly doubling its headquarters space there to 36,000 square feet by taking room adjacent to its Kas Drive location. It expects to move by mid-May, Cantwell says. The company has an office in Hong Kong, as it sees much of its new business opportunities coming from Asia. It is also planning to open a New York City office at an unspecified date and has employees located there and in seven other major cities across the United States. Gartner Inc., a Stamford, Conn.-based market research concern, projects the market for in-building wireless systems will grow from $424 million in 2004 to $1.16 billion by 2008. Of that, the biggest piece, and biggest opportunity, is in selling hardware for the systems, according to Phil Redman, Gartner's Boston-based research vice president, mobile and wireless. Hardware, such as that developed by InnerWireless, will grow from $200 million to $500 million over that span, he says. The second piece of the market, maintenance and service -- essentially keeping installed systems up and running -- will go from $94 million last year to $311 million in '08.The last, implementation, will grow from $130 million to $350 million, he says. Developing hardware is the best growth area largely because it enables players in the space to differentiate themselves, he says. Implementations, he says, are more labor-intensive "grunt work" that can be done by large technical-service firms, he says. InnerWireless has at least two partnerships with service providers for installation work on its system: Norwalk, Conn.-based Emcor Group and Armonk, N.Y.-based IBM. Redman believes InnerWireless is among the top five players in what he calls a crowded industry. He likes InnerWireless' strategy of pursuing big companies and health care concerns, because many are looking to replace older, more complicated systems. Still, he cautions that all players in the space need to focus on differentiating their technology, be it on the types of technologies they support or on supplying antennas that can both send and receive data, rather than just receiving. "Everybody needs to do a better job on building awareness of the capability of the technology in the industry," he says. Competing systems "are looking more and more commoditized." 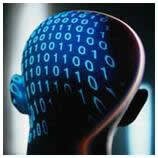 Brain tumors did not occur more frequently on the side of the head where the phone was typically used. There was no increased risk for brain tumors related to cell phone use, frequency of use, or number of years of use. Cell phones do not cause brain cancer, concludes a new study published in the April 12 issue of Neurology, the scientific journal of the American Academy of Neurology. The study was supported by the European Commission Fifth Framework Program, International Union Against Cancer, International Epidemiology Institute and Danish Cancer Society. The Danish study questioned 427 people with brain tumors and 822 people without brain tumors about their cell phone use. The study found no increased risk for brain tumors related to cell phone use, frequency of use, or number of years of use. “These results are in line with other large studies on this question, including a recently published large-scale, population-based study by the Swedish Interphone Study Group,” said study author Christoffer Johansen, PhD, DMSc, MD, of the Danish Cancer Society in Copenhagen. “There have been a few studies that found an increased risk of brain tumors with cell phone use, but those studies have been criticized for problems with the study design,” he observed. For 27 people with brain tumors and 47 people without brain tumors, researchers obtained phone records from cell phone companies to document the amount and length of calls and compare the actual calls to what participants reported. Those results found that people accurately remembered the number of calls they made, but did not accurately remember the length of those calls. But there were no differences between the two groups on how well they portrayed their cell phone use. That finding minimizes the possibility of what researchers call “recall bias,” or the chance that people with brain tumor may exaggerate or underestimate their past cell phone use, Johansen said. The researchers also found that brain tumors did not occur more frequently on the side of the head where the phone was typically used. LAS VEGAS, Nev.—6 April 2005—Motorola, Inc. (NYSE: MOT), the leading provider of Mission Critical Communications solutions, unveiled four new products—a new generation pager for volunteer firefighters, two new Professional Series Radios for small business, and a new dispatch solution—this week at the International Wireless Communications Expo (April 6-8) in Las Vegas. One of the products, the MINITOR V™ pager, will allow volunteer firefighters to record a message of up to eight minutes, one of the longest recording times in the industry. This would enable the dispatch center to send a longer, more detailed message so firefighters would have more information about the emergency prior to arriving on scene. Bandwidth Options—MINITOR pager now provides the option to program the pager on narrow or wide-band channels for both UHF and VHF. Improved Sensitivity—receive calls consistently even in fringe or weak signal areas. Expanded Alert Tones—as many as 12 programmable tones, including new musical options, are available to communicate specific alerts. Tremendous Stored Voice Capability—recording time increase to eight minutes, one of the longest in the industry. Rugged Dependability—sturdy housing and solid, responsive knob action. The MINITOR V meets Military Standard Procedures 1 for driving rain. For two-way radio users in small to medium-sized businesses and communities, the company announced its new PR860™ and PR1500™ two-way radios at this year’s IWCE. New Rugged Housing—solid case and ergonomically designed controls give the users of the PR860 confidence and allow them to easily operate all buttons and knobs. Durable, but not heavy—For users upgrading from the HT750™, they'll notice more features but not more weight. Lightweight (12.8 oz. with impress™ Li-ion battery) and long battery life enable long shifts and heavy use. Clear audio quality—available in 16 channels. User-friendly programming software. - Windows updated CPS, the easy-to-use way to custom program multiple radios at same time. Accessory flexibility—An expanded line of audio accessories provide users more customization. Existing Professional Radio tier accessories are compatible with PR 860. Customized audio/superb sound—Refinements to the circuitry give the PR1500 a rich, full audio which users can customize to their specific preferences or needs. Adjustable bass and treble to compensate for different listening environments. Improved talk range—Excellent specifications for transmission and reception provide better range and more reliable reception. 32 Channels—All PR1500 radios provide 32 channels. Note: The MINITOR V pager and the PR860 and PR1500 radios are available for sale from Motorola Authorized Two-Way Radio Dealers beginning in mid-April. MIP 5000: New Dispatch Software Solution for Fleets, Campuses, Utilities and Public Safety. Motorola is expanding its VoIP (Voice Over Internet Protocol) portfolio with the introduction of the MIP 5000 Dispatch Software Solution. For customers who already own Motorola desksets migration to VoIP is supported via the compatible MIP Gateway. The MIP 5000 dispatch solution is designed to benefit customers in manufacturing, fleet dispatch, campuses, utilities and public safety organizations and will be available later this year. Motorola is a Fortune 100 global communications leader that provides seamless mobility products and solutions across broadband, embedded systems and wireless networks. In your home, auto, workplace and all spaces in between, seamless mobility means you can reach the people, things and information you need, anywhere, anytime. Seamless mobility harnesses the power of technology convergence and enables smarter, faster, cost-effective and flexible communication. Motorola had sales of US $31.3 billion in 2004. 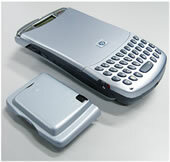 For more information: www.motorola.com. Did RIM Pay Too Soon? A month after forking over $450 million to NTP for five patents, one was rejected by the patent office. Others may meet the same fate. Research In Motion (RIM), maker of the ubiquitous BlackBerry, last month paid $450 million to settle a furious legal battle over five patents held by NTP. The markets welcomed RIM's decision to settle, boosting its stock 8% overnight, to $64.85. But RIM might soon regret that it ever made a deal. On Apr. 6, the U.S. Patent & Trademark Office rejected one of the five patents NTP had accused RIM of infringing and gave a strong indication that the other disputed four might soon be rejected upon reexamination as well. The agency has been taking a second look at more than 2,000 claims made on a total of eight NTP patents, including the five that RIM allegedly infringed, ever since Arlington (Va).-based concern sued RIM in December, 2002. After more than two years, the officials have rejected all 523 claims NTP made on three of those patents. MERCILESS TROLLS. RIM Vice-President Mark Guibert declined all comment on the patent-office announcement. The company has called the settlement "full and final." And NTP attorney James H. Wallace Jr., a partner at Wiley Rein & Fielding, said the patent office's overturning of the patents represents a mere interim step likely to be appealed. "Don't declare who's won the baseball game at the top of the first inning," Wallace said. "That's just the first step in a multiyear process." This latest development in the BlackBerry saga—and patent holding company NTP's admission that the case is far from over—serves as the surest sign yet of the pressing need for reform of the patent system (see BW, 4/18/05, "How Ampex Squeezes Out Cash "). Patents have become too easy to get, and the current judicial culture makes them all-too-convenient to defend in court as well. The situation has put many businesses at the mercy of so-called "patent trolls," outfits that exist solely to buy up hundreds or thousands of obscure patents with the expectation that they'll eventually manage to extract lucrative licensing agreements from businesses in need of the technology, or sue for infringement if they can't. Everyone has a right to protect his or her intellectual property. But the underfunded, hidebound patent office consistently errs on the side of approving questionable grants, and the specialized Federal Circuit Court, created in 1982 to hear nothing but patent appeals, often shows bias toward intellectual-property owners. RESCUE GROUPS. In a knowledge economy heavily fueled by intellectual property, the existing dynamic puts an awful lot of power into the hands of a few. As a result, in recent years, large companies, Microsoft (MSFT) among them, have gone on the defense, amassing hundreds of patents in an attempt to fend off unscrupulous players. Nonprofit groups have begun organizing to buy patents out of bankruptcy to put them in the public domain and keep them out of the hands of patent trolls. Prodded by intellectual-property owners of all stripes, from Microsoft to small inventors, Congress this year will begin studying ways to fix the system. In the case of Waterloo (Ontario)-based RIM, the broken patent system has concrete effects. Some RIM rivals, including Good Technology, agreed to license patents from NTP rather than join the legal battle. And RIM is out the more than the $450 million it paid to license NTP's patents in perpetuity. APPEAL LIKELY. On Apr. 6, the day the patent office rejected one of the litigated NTP patents, RIM reported a $2.6 million, fourth-quarter loss that it blamed in part on its ongoing litigation with NTP. The resulting 7% stock drop—RIM shed $5.20 a share in after-hours trading—wiped out any gains it saw from its settlement in March. Jim Balsillie, Rim's chairman and co-CEO, sounded upbeat about the settlement in his conference call with analysts: "It's safe to say we're pleased to put this matter behind us and focus on the business of building BlackBerry." The matter might be behind RIM, but it certainly isn't over. NTP will surely appeal the patent office's rejection of its patents, a process that could take years, and end up right where it started—back in the Federal Circuit Court. I figured if anyone in the industry would have an some insight on this subject . . . you would. From what I understand, the FCC prohibits scrambling or blocking radio signals. Therefore, if a theater owner wanted to block or scramble cell phone signals so that they would not work in the theater, he would be in violation of the law. Is that your understanding? Hope you don't mind me bouncing this off you. Thanks for your help. The FCC says that using a jammer is considered "theft" of airwaves, because that spectrum has been allocated as property to a commercial entity. There are many ads on the internet for cell phone jammers. Just remember "jammer" rhymes with "slammer"—as in imprisonment for up to one year for each offense. There is a lot of interest in legally creating areas where cell phones will not work. The solution should be no mystery to anyone who has worked in the technical side of Paging or two-way radio communications—it is called shielding. Radio repair shops of all types usually have a "screen room." 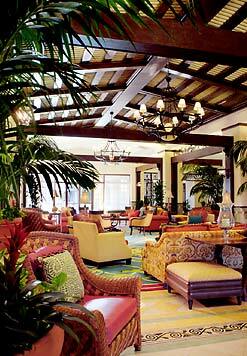 This is simply a room completely enclosed with copper or brass screen. (Like plastic window screen but made from metal wire.) Some of the more elaborate ones have every wire going in and out of the room running through an RFI filter, grounding "fingers" around the door, and every miniscule opening completely covered. Inside of the screen room, you will find a test bench with all the electronic equipment necessary to diagnose, repair, and align pagers and other radio equipment. 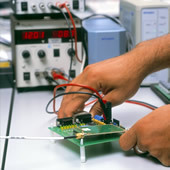 The idea, of course, is to keep all radio signals out of the room while a technician or engineer is working on a radio. Imagine how difficult it would be to try and tune a pager while it is receiving a very strong signal—you can't do it. So, since jamming any radio frequency with a transmitter is illegal, the best way to stop cell phones from functioning in an office, a restaurant, or other area is to shield the area so the radio waves can't get inside. This is no trivial undertaking but it is much more practical today thanks to the many new materials that will block radio signals and that are more aesthetically pleasing than copper screens. A good example is the aluminized Mylar plastic film this is used to tint windows. Some of these are specifically designed to block cell phone frequencies. There are also now many types of construction materials, including drywall, plywood, doors, and windows that include RF shielding built into them. An area properly designed and constructed to be a "radio quiet zone" will keep out almost all RF, not just cell phone signals. Just remember, however, you can't leave the door open. ReFLEX two-way devices are also available and will be featured in next week's advertisement. Nevada-based EasyTel.Net announced today that it has launched a fully revamped web site, built in part around a new free service it is offering to its subscribers, their customers, family and friends. The new service—called "Reach Me Now!" 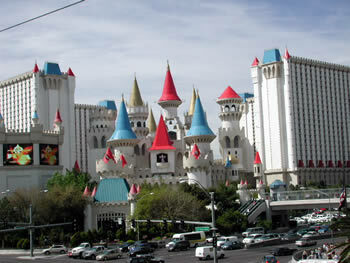 [ClickPress, Sat Apr 02 2005] Nevada-based EasyTel.Net announced today that it has launched a fully revamped web site, built in part around a new free service it is offering to its subscribers, their customers, family and friends. The new service—called "Reach Me Now! "—is a free paging service through which anyone can reach any EasyTel subscriber from any web browser anywhere in the world free. "We're making paging simpler to use than ever before," said EasyTel president Randal Skala, "even if you don't have a pager." Every Genie Subscriber has a Genie Number for their account. This is just like a telephone number, with an area code, prefix and number. Just enter the Genie Number for the subscriber you wish to reach, along with the phone number you want that subscriber to return your call. When you click the SEND button, Genie will immediately send that subscriber a message with your phone number and the time/date you "paged". That subscriber will get the message in whatever way they decided to use when they set up their Genie account. They may get an actual page on a regular pager. They might get a voice message on their cell phone. Genie might send it to them as an email message. They might even get ALL THREE, and more!! But they WILL get it; even if they have their cell-phone off and are out of pager range—because Genie will hold the message for them until the[y] DO get it." Another key feature of the new web site design is a set of user stories intended to make it easier for visitors to understand how best to use the wide array of services provided by EasyTel. Called "What's In It For Me?” the stories are broken down into two groups, one for Business users and the other for Consumer users. But Skala is quick to point out that the distinction is almost an arbitrary one. "The line between business and consumer when it comes to phone communications, Internet, banking and e-commerce is fuzzy at best and growing fuzzier every day. Anyone is very apt to find stories that apply to their own life in either category." APRIL 14, 2005 (IDG NEWS SERVICE)—Apple Computer Inc. yesterday reported record quarterly earnings and revenue on significant increases in Macintosh computer and iPod digital media player shipments. The Cupertino, Calif.-based company posted a net profit of $290 million, or 34 cents per share, for its fiscal 2005 second quarter, which ended March 26. That compares with earnings of $46 million, or 6 cents per share, in the year-earlier period, the company said in a statement. In the second quarter, Apple said it shipped 1.07 million Macintosh computers and 5.31 million iPod players. That's up 43% year on year in computer shipments and up 558% on the iPods. Revenue for the quarter hit $3.24 billion, up 70% from $1.9 billion in the year-ago quarter. International sales accounted for 40% of Apple's revenue in the quarter, the company said. The results are records in both earnings and revenue, Apple CEO Steve Jobs said in the statement. Apple's results beat Wall Street expectations. Analysts had forecast 24 cents in earnings per share on $3.21 billion in revenue, according to a consensus estimate from Thomson First Call. Apple is optimistic about the future, with new products in the pipeline for the coming year, starting with an update to its Macintosh operating system to be released later this month (see story). 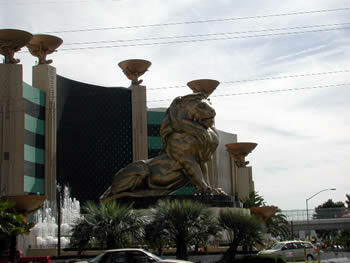 The company predicted revenue of $3.25 billion and earnings per share of about 28 cents for its current third quarter. In the past quarter, 62% of Apple's revenue came from its Mac business, which grew 27% from the year-ago quarter driven by strong Mac, peripheral and software sales, Apple Chief Financial Officer Peter Oppenheimer said during a conference call. The company shipped 608,000 desktop systems during the quarter, an increase of 55% from the year-ago level. Combined sales of iMac G5s, eMacs and Mac Minis more than doubled to 467,000 units from the year-ago quarter, and PowerMac shipments totaled 141,000, Oppenheimer said. Total portable shipments hit 462,000 units, up 29% from the year-ago quarter. Apple shipped 251,000 iBooks and 211,000 of the recently refreshed PowerBooks, according to Oppenheimer. Apple's digital music business, which includes the company's iPod music players and iTunes online music store, generated 38% of total company revenue and grew 280% compared to the year-ago quarter, Oppenheimer said. The iTunes store operates in 15 countries and last week sold its 350 millionth song download, Oppenheimer said. Shipments of iPods, over six times the year-ago level, were driven by strong response to the new iPod Shuffle, a refreshed 4GB iPod Mini and a new 6GB iPod Mini, Oppenheimer said. Apple in the quarter also lowered the price of both of its iPod Photo models. The iPod Shuffle is now the top flash-based MP3 player in the U.S. with a 43% market share in February, Oppenheimer said, citing NPD Techworld numbers. Apple is very happy with the performance of its retail stores. Revenue from its retail segment more than doubled from a year ago to $571 million and actually increased sequentially, bucking the expected seasonal decline. Apple opened two stores in the quarter, bringing the total number of Apple Stores to 103. The company expects to end its fiscal year with 125 stores, including 10 outside the U.S., Oppenheimer said. The company's record earnings did nothing to help Apple's stock, which ended the day with shares down $1.62, or 3.8%, at $41.04 on the Nasdaq Stock Market. 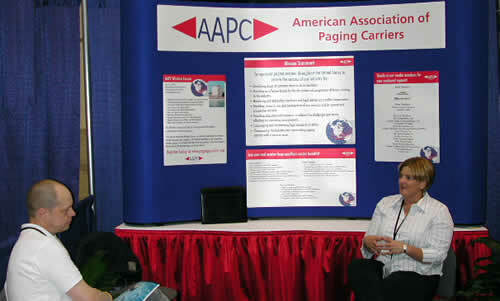 The American Association of Paging Carriers had a nice booth and made information available about the activities and accomplishments of the association. This organization represents the interests of the US paging companies through group activities and legal counsel. Membership is available to vendors, carriers, and individuals. All interested parties are urged to join and help promote paging and its many related businesses. 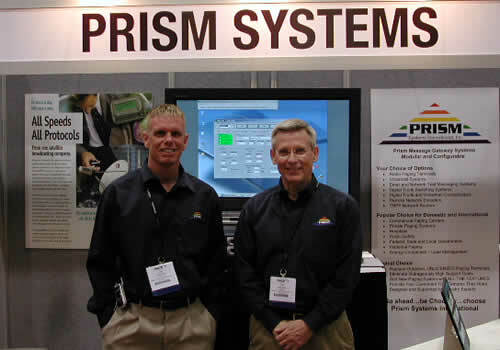 Jim Nelson and Jim Nelson (father and son) representing Prism Systems International, the able manufacturer of Message Gateway Systems. Among their products is an incredibly versatile Paging Control Terminal (PCT). There are many Paging operators using terminals that are no longer supported with service or spare parts who should talk to this company about a modern and current replacement product. They were also promoting their TNPP Network Router. SEAN MALONEY, general manager of Intel's mobility group is here in old London Town. He said that Intel realised some years ago that fibre wasn't the answer to delivering broadband He said that while there were lots of technical challenges with Wimax, Intel had gotten over them one by one. 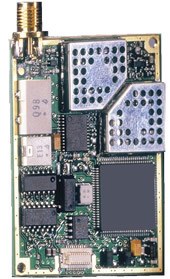 He said that Intel has just shipped its first production chips for wireless DSL. The second version, 16e, is probably three to four months behind schedule. He said Intel's feeling is that we're heading towards a global WiMAX standard and will see economies of scale. Signals, he said, penetrate better than people expected and there's a growing confidence people will give coverage. He said that Intel is arguing that spectrum for WiMAX should be technologically agnostic because something better than WiMAX may come along. In Europe the argument revolves around 2.5GHz and 3.5GHz, he said, but Intel is from a camp that says more is better. We're impatient but a government around the world is going to lead on this. Korea is already leading on WiMAX at 2.49GHz. It has allocated WiMAX spectrum already, he said. Sean Maloney talked to Sally Pettipher, the head of development of the Science Museum archives, using a WiMAX connection and a phone using Skype. She said that the archive site is an old warehouse on an ex aerodrome and we needed to keep a track of the archives. People used to use pen and paper and drive a mile across the site and it was entirely antiquated. Networking the site would have cost a million pounds that we didn't have and Intel offered us a WiMAX solution, she said. Intel installed it for nothing, she added. Maloney said there would be an option for WiMAX in laptops in 2006. BUFFALO, Minn.—Merton Auger, the city administrator here, likes to talk about "cutting down windshield time." That's the dead time when a public works employee drives to city hall to fill out a report on a busted street light or some other municipal malfunction. Such a trip isn't necessary anymore in Buffalo, a town about 40 miles west of Minneapolis. Public employees, including police officers and firefighters, either have or soon will have full mobile computing capability, just as if they were in an office. Buffalo is an early adopter of a technology known as a "mesh network," a wireless system that Schaumburg-based Motorola Inc. found so promising that it recently bought a leader in the field, MeshNetworks Inc. Buffalo's network, switched on two months ago, was the first under the Motorola name. Motorola has long been a market leader in wireless communication systems for public agencies, particularly police and fire departments. Mesh networks take those systems a step further, boosting their ability to transmit data and images, from routine accident reports to—eventually—real-time footage of police chases. Mesh networks have potential life-saving attributes, too. Vehicles and people can become "nodes" in a mesh network, sending and receiving radio signals. The technology can thus be used to track firefighters in a burning building. In fact, Motorola has a product due out later this year to do exactly that. "It's the coolest thing we've had in a long time," Motorola system architect Keith Kemmerline said of the technology. 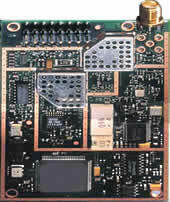 Kemmerline works in the Motorola division that specializes in radio systems for municipalities. It doesn't get the attention of Motorola's mobile phone business but it has been a core operation for decades and comprises about 15 percent of the company's $31.3 billion in total sales last year. Maitland, Fla.-based MeshNetworks, on the other hand, was just a step beyond a start-up when Motorola bought it earlier this year for $169 million. The firm was created in 2000 after buying mesh network rights from ITT Industries Inc. (which had originally designed the technology for the U.S. military). 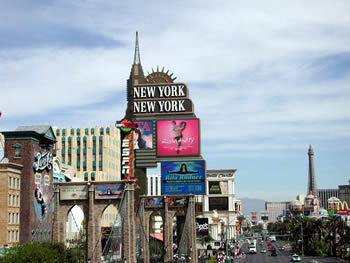 Its system is operating in five other cities: Medford, Ore., Cocoa Beach, Fla., Garland, Texas, Portsmouth, United Kingdom, and, on a test basis, Las Vegas. The mesh starts with a network of radio transmitters that blanket a city, usually attached to light poles. The more hills and buildings—and the bigger the city—the more radios needed. In Buffalo, a flat town of 13,000 people, there are 83 radios spread out over 11.5 square miles. In addition, seven Buffalo police cars have mesh radios and 20 public works employees have mesh-enabled laptops in their vehicles. The radio signals bounce between the fixed and the mobile nodes to create a communications mesh. Even the laptops equipped with mesh cards are transmitting points, albeit somewhat weaker. A mesh network with no fixed radios is a concept soon to be reality with Motorola's MeshTracker. Due out later this year, it would allow firefighters to establish a network in a burning building, for instance. Each firefighter inside would carry a small mesh-enabled radio, allowing someone on the outside to track his whereabouts. In Buffalo, Auger isn't looking that far out yet. He's busy breaking in the city's network, which cost $550,000—about $48,000 per square mile. It was a significant investment but only comprises 3 to 5 percent of the city's capital budget over the next five years, he said. So far, Auger likes what he sees. The network, which was installed by Lombard's Scientel America Inc., has delivered as advertised, with only a smattering of weak transmissions, he said. "There's one or two spots where we need to put up [fixed] antennas, but our technical people are really impressed," he said. It has also been effective in "pushing the desktop out to the field," as Auger put it. City workers are now doing work in vehicles they previously would have done in an office. And they have more tools at their disposal, including speedy Internet access in their vehicles. One Buffalo police officer recently used the mobile Web to catch someone driving with a revoked license, according to Mitchell Weinzetl, the city's police chief. The driver gave the officer her name but claimed to have misplaced her license. So the officer went to the squad car and tapped into the state motor vehicle department Web site. He typed in the name given by the driver, but the picture that appeared wasn't the driver's. Turns out the driver had given a false name because her license had been yanked. Without the Web, there would have been no way to see the picture. Winning over police departments is crucial if mesh networks are to become standard for municipalities. Police officers and firefighters can be a tough sell on new technologies because they come from a culture in which wrong decisions can mean life or death, said Motorola's Kemmerline. "Public safety folks don't like to do anything untested, untried, unproven." And at this point, said telecom analyst Ronald Gruia, mesh networks are "relatively unproven." The technology is "still in a baby stage right now," said Gruia of consulting firm Frost & Sullivan. However, Motorola may offer a boost for mesh technology, since the company is so prominent in public safety communications. "People are much more willing to take a risk on this," said Rick Rotondo, Motorola's mesh marketing director and an executive with MeshNetworks before the buyout. "The thinking now is `Motorola is behind it, maybe there is something to it.'" A key competitor agreed. Motorola's entrance "validates the technology, the idea that it's something that public safety agencies should be looking at," said Bert Williams, marketing vice president at Sunnyvale, Calif.-based Tropos Networks. Williams said he expects Motorola's entrance into mesh might lead to other partnerships between the technology's pioneers and large radio equipment makers—Motorola's major competitors. "There will be acquisitions in that space for sure," Gruia agreed. What: A wireless system for public agencies to transmit data and images, including routine accident reports and—eventually—real-time footage of police chases. How it works: A network of fixed radio transmitters blankets a community while cars and laptop computers also act as transmitters. Radio signals bounce between fixed and mobile nodes to create the mesh network. Significance: Work typically done in the office can now be done in the field, saving time. Police officers and firefighters also have high-speed Internet access in their vehicles. The future: Vehicles and people act as "nodes" in the mesh by sending and receiving radio signals. Hence, the technology can track firefighters in a burning building. I hope you enjoyed this issue. I have always been fascinated by everything related to radio communications. 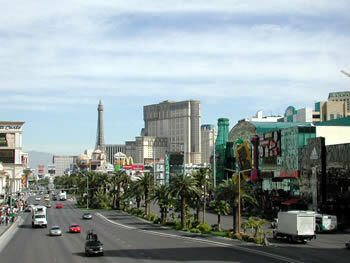 Someone asked me at the IWCE show in Las Vegas last week if I get tired of putting the newsletter together every week. While I am quick to admit that it is a lot of work—finding all the news and writing the occasional editorial—I never get tired of it. Forgiveness is not forgetting . . . it is remembering and letting go.